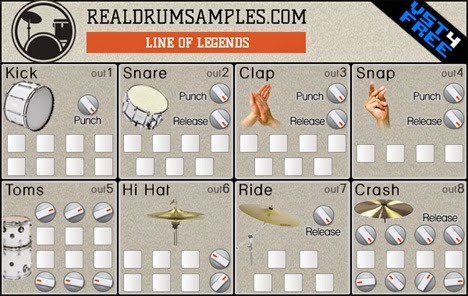 released by RealDrumSamples.com. Check out their commercial products if you need more ! The interface is divided in 8 sections (Kick, Snare, Clap, Snap, Toms, Hi hat, Ride, Crash). Each section uses its own individual output for an easier handling in a productive environment. +Punch knobs for attack sculpting. +Release and Pan knobs (not labelled). if it shows only output 1 on start-up.